Introducing the Enhanced Valuation Spreadsheet! This month marks the start of the third volume of the ModernGraham Stocks & Screens publication. Thank you to all members for helping to support my continued efforts on this site by being premium members. 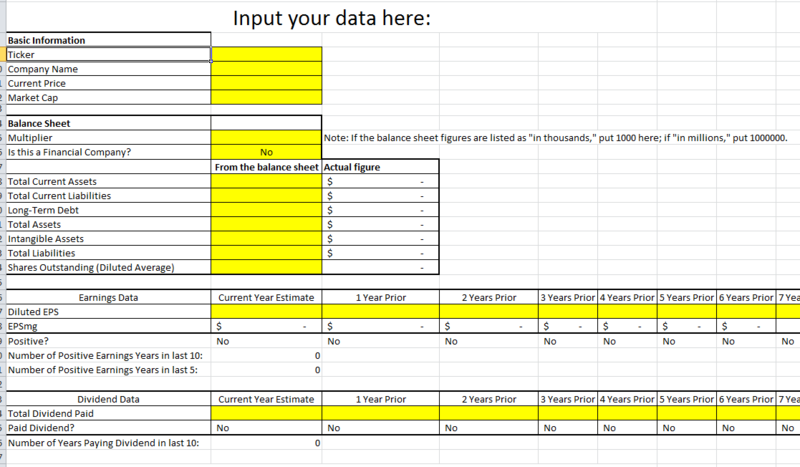 To commemorate the occasion, I’ve created new premium content, the Enhanced Valuation Spreadsheet! 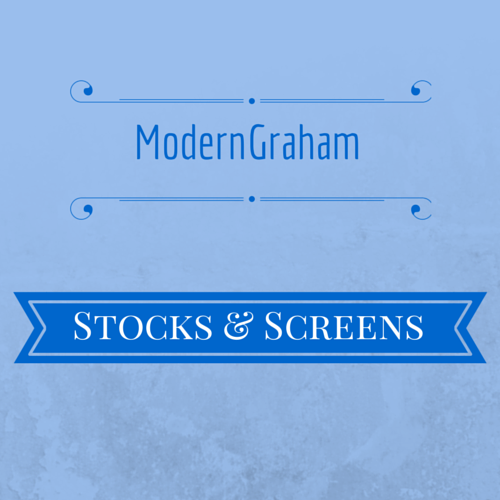 More on that in a little bit, but first – the January edition of Stocks & Screens is now available! Get it here if you’re currently a premium member! You may notice that I’ve also added two new screens to the list – Companies Trading Below Their Graham Number, and Dividend Growth Companies. In addition, I’ve removed the mock portfolios from the PDF report for now, but do plan to continue them in a different format (and possibly add a couple of other mock portfolios to the site!). Basic Premium Members get access to the Stocks & Screens publication. 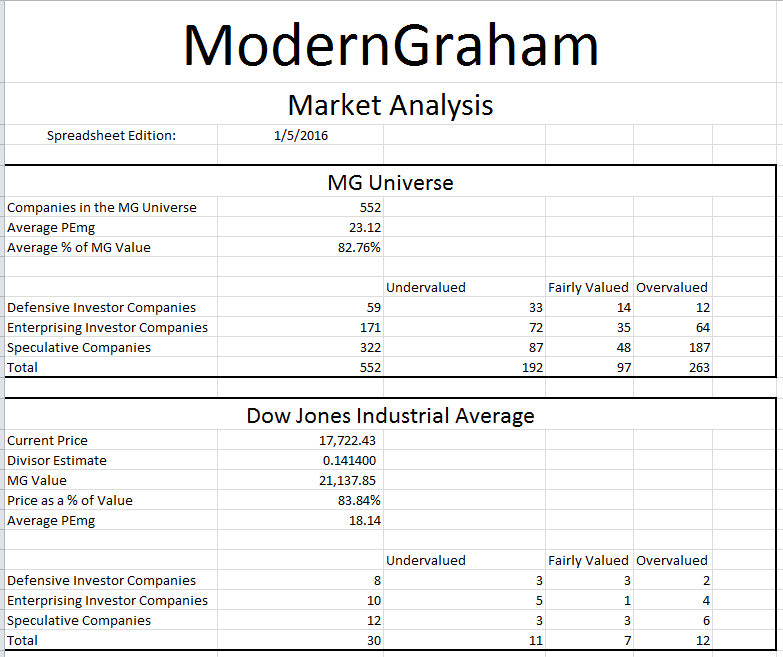 Inside this monthly PDF report and spreadsheet is a listing of all the companies reviewed by ModernGraham (currently 552 different companies) in a handy table with some key figures, including dividend yield information. It then proceeds to screen the companies regarding different topics. 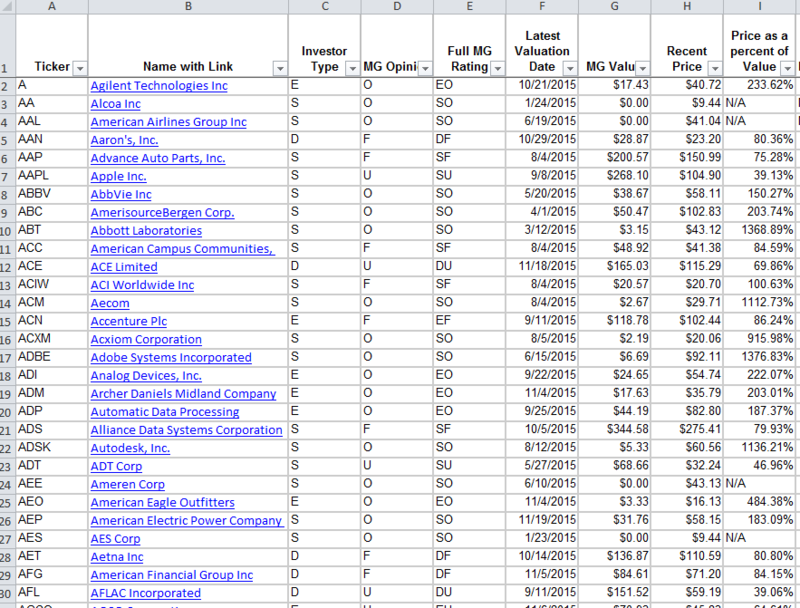 This is a great tool for your research into value investing opportunities. Please note that this month is considered a beta period, where feedback on the tool is greatly appreciated! If you have comments on what you would like to see in the spreadsheet, or if you become a member and have any trouble with the spreadsheet, let me know by email or commenting on this post. For a limited time, the price to become an Advanced Premium Member is discounted. Early adopters can lock in a subscription rate by signing up now and (hopefully, though not required to lock in the rate) providing me with feedback! Single Month – $29.99 – only $19.99 for a limited time! (NOTE: This offer expired at the end of January 2016). Monthly Recurring – $19.99 – only $14.99 for a limited time! (NOTE: This offer expired at the end of January 2016). Annual Recurring – $159.99 – only $119.99 for a limited time! (NOTE: This offer expired at the end of January 2016).